A suit’s lapel ends at the point where you button it, so a single-breasted suit with three buttons will have a shorter lapel and a higher buttoning point than one with two buttons. A lower button point elongates the lapels and therefore makes the wearer appear leaner and taller. That’s why men who are very tall often choose three-button suits to counterbalance their height. Contemporary suits generally favor higher buttoning points, which creates a broadening of the chest if you are lean. 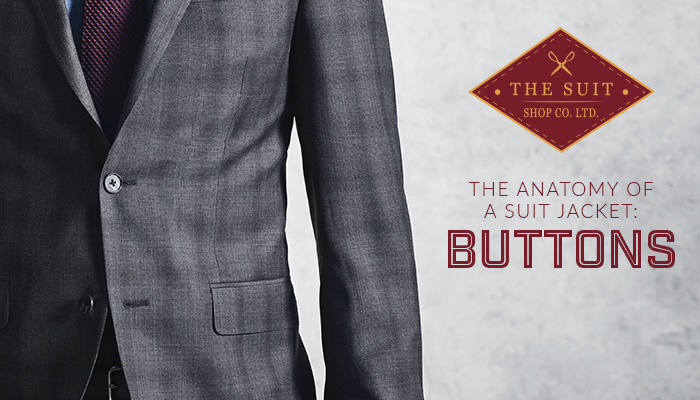 Those who carry more weight will prefer a lower buttoning point because it has a thinning and elongating effect. A lower top button also pleases traditionalists because it presents more of a "business suit" look. Three-roll-two single-breasted jackets also referred to as having 2.5 buttons, have become quite popular in recent years. The lapel is gently ironed to incorporate the top button into the fold the lapel. This top third button is never meant to be closed, but the profile of the lapel that results is one that shows an elegant roll. Double-breasted suits are more complicated as button possibilities are usually provided in terms of numbers like 6×2, 6×3, 6×1 or 4×2. The first number represents the total number of buttons on the front, with the second number indicating how many of those can be fastened. The 6×2 is most common, perhaps followed by the 4×2. Even when there are two functioning buttons, one usually closes only the top one. The more buttons the more formal, with the 6×3 resembling a peacoat or naval uniform and four button versions, often appearing rather laid back. Sometimes forgotten are the buttons on the suit sleeves. Usually, there are four, but some summer jackets show three. Kissing buttons, where the sleeve buttons touch one another or overlap slightly, have become particularly popular. Also nowadays, the explosion of interest in refined tailoring has meant that these are more often working buttons on ready-to-wear suit jackets than they used to be. You can open the bottom one or two, either to show off that you have a quality tailored item. In fact, functional sleeve buttons make sleeve length adjustments difficult for your tailor. Finally, the lapel buttonhole was originally designed as a way to fasten your collar under your neck as a remedy against bad weather, that is, until the button on the opposite side disappeared from the design. Now, this function is vestigial, but the hole has become the perfect place for a boutonniere flower for a dash of added style. Hand-sewing of the buttonholes, including the one on the lapel, is often a hallmark of a bespoke or otherwise high-quality suit.